What is an email click rate? Measured in both HTML and text-only emails, click rate provides a way to evaluate recipient engagement with an email – it is the percentage of links opened in emails opened. The percentage shows a percentage of those who clicked one or more links in an email and landed on the sender’s website, blog, or other desired destination. The click rate is calculated by dividing the number of click-throughs by the number of tracked messages opened. The more links in an email, the higher the chance for a higher click rate percentage. Most email marketers use this metrics along with open rate, bounce rate and other metrics, to understand the effectiveness and success of their email campaign. In general there is no ideal click-through rate. This metric can vary based on the type of email sent, how frequently emails are sent, how the list of recipients is segmented, how relevant the content of the email is to the audience, and many other factors. The day of the week and even time of day can affect click-through rate. How can I view my email click rate? Step 1: Click on Stats on the left main navigation. 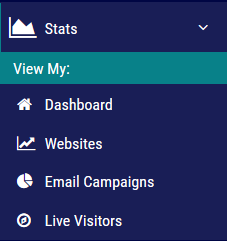 Step 2: Click on the Email Campaign tab below the Stats section. View the blue section entitled Unique Clicks to view your email click rate.